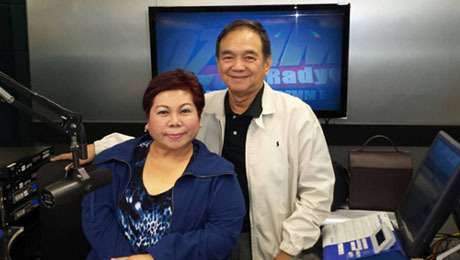 ‘Pinoy Vibes’ psychic and life coach, Stargazer, with Dr. Bibiano “Boy” Fajardo. MANILA, Philippines- Filipinos the world over sat glued to their radios, television sets, or computers last weekend as Dr. Bibiano “Boy” Fajardo explained traditional Hilot healing on DZMM Teleradyo’s program, Pinoy Vibes. While it was not the first time that Dr. Fajardo was invited by popular host, Stargazer, to be her guest, this was the first instance that the entire program was devoted to traditional Hilot. The episode was aired live on Feb. 2, 2014 from 1:00 a.m. to 3:00 a.m. Philippine time. Listeners and viewers paid rapt attention as Dr. Boy Fajardo explained in depth what traditional Hilot really is. According to Dr. Fajardo, Hilot is our ancestors’ own form of traditional medicine, used to restore the health of the whole person—it does not heal only the physical body, but also the mind and emotions. He clarified that Hilot is not simply a form of massage for relaxation as many people think it is. Rather, it is a complete health system that has an energy component, a physical component (hilot), and an herbal medicine component to address imbalances in the body. It also has process for dealing with inner conflicts and disharmony, which, according to tradition, are the root causes of disease. In the course of the program, Dr. Fajardo also enlightened the listeners and viewers on the scientific basis behind the orasyon or bulong, one of the most mysterious and misunderstood aspects of Philippine traditional healing. He explained that it is not a prayer (as must have been widely assumed, that’s why it became known as “oracion”), but rather, a set of sounds that induce the healer to breathe in a specific manner and allows him or her to become a channel for healing. Stargazer entertained callers’ questions on the program, which paved the way for Dr. Fajardo to explain the causes, prevention, and traditional treatment for specific ailments such as asthma, arthritis, and cancer. isa po ako sa mga nakapanood ng episode na ito kaya ho ako nagka- ideya na magkaroon ng hilot center sa bayan namin. maramaing salamat muli sa isang enlightening na palabas. Maraming salamat din po G. Custodio sa inyong suporta at pagsubaybay. 🙂 Naway mas maraming Pilipino ang maging katulad ninyo na bukas ang isip sa Hilot at bukas ang puso sa pagtulong sa kapwa. gusto ko pong mag aral ng traditional hilot, san po ako pwede pumunta? Salamat po sa inyong interes na matuto ng Hilot. Antabayanan lang po kami dito sa aming website o di po kaya sa Facebook (facebook.com/HilotHealing) para po sa anunsyo ng susunod na training. Salamat po.